I do not think the words, “evacuation” and “sabbatical,” should ever, ever be tossed around together. And while I’m on all the things that should not happen during a sabbatical, learning about coastal flooding would be another. I drove in from Texas seven weeks ago to the Outer Banks of North Carolina. I must admit to loving every moment of being here, even the heartbroken ones, even the ones like last night as pitch black descended, preventing vision of any kind as to how high the water was rising. I’d forgotten to pack the flashlight. Damn it. I exchanged Austin’s 104 degrees for Kitty Hawk’s balmy, oh who am I kidding, moist, sticky 88 degrees. Today, it is 66, winds are 12 mph, gusts are 23 mph. If you lived in the Carolinas, you would know that gusts are important to note. I do not live in the Carolinas. I only sabbatical here, using sabbatical as a verb because when one is creating during a time of rest and relaxation, anything is possible. This is my sabbatical; my writing sabbatical, my writing road-trip sabbatical, a writing road-trip evacuate-to-higher-ground-from-flooding sabbatical, apparently. This has been a wild 24 hours and one I’m sure will end up in some book in the future, but I could have done without the surges. Coastal flooding, according to the National Weather Service, is flooding caused by seawater pushed onto the shore by the wind. This is also known as a “storm surge,” occurring normally during high tide, but when there is a hurricane lurking even low tide can be dangerous. Think about your relatives that you do not like who show up at your front door. That is a storm surge. The high for wind “gusts” was 26 mph. Wind blows your hair back into a natural, feathered look as though you were posing for a Wella commercial. “Wind gusts” assault your thighs and cheeks with sand that only a few days earlier was lusciously between your toes. This same sand can now poke your eye out same as any BB gun, along with the debris that flows in with the high tide. Everything is not bigger in Texas, certainly not the driftwood I see floating by in chunks in Kitty Hawk. Two days before Hurricane Joaquin hit, I went shell collecting. Rains beat down the dunes so much in the previous days that walking the beach meant straggling one leg higher than the other for long distances. Uncomfortable yes, but worth the ache as strong tides brought in huge concha shells. I call them “concha” because that is the original Portuguese name, but some of you may know them as “conch” shells. Those who say conch might also be the same ones who think Joaquin was chosen to be politically correct. Seriously? It’s a Hurricane. Joaquin is a name. They needed a ‘J.’ Don’t worry, the brown people won’t hurt you. The cottage owners said we hadn’t seen the worst, but as I had zero experience with a storm of any nature, I thought that meant we might see more rain. I didn’t think that meant I should make ready an evacuation backpack. The day before, I saw gulls trying to fly away. The most they could do was hold steady and see where the wind took their wings. It reminded me of watching a gull on the shores of Busselton, on the far western edge of Australia, south of Perth. I’m not sure why, but I guess I assumed birds had some extra special wind connection with storms, that they could still leave as they needed. But I also thought, well it’s Australia and things are different, maybe birds can’t just leave. Here in Kitty Hawk, though, if the birds were having a hard time getting out, what was it going to be like for me and my spastic cat? Evacuation refrigerator: Only one of those bottles of Proseco is full. One pair of running shorts in addition to the clothes on my back and a creamy white zip up jacket. My mother would be aghast if she knew I brought something white which would show stains. Coffee cup with my niece’s toddler face on it. CLICK to enlarge: Sandpipers painted by Hatteras Island artist, Stephanie Kiker, on the Outer Banks of North Carolina. Items forgotten: Dental floss, hair bands to keep my big hair off my hot menopausal neck, and a flashlight. CLICK to enlarge: One evacuation dinner. Already, I have written this adventure into Ava and Daniel’s story. Who knows if it will stay there, if it will make the final editing cut. And, I have returned to my evacuated cottage from the one up on stilts and from where I write this blog as the winds pick up to a ferocious speed of 26 mph with rain added in for ambiance. Maybe I should have been more aware of the weather dangers in this part of the U.S. But, that would have required me to do some research outside of the eight hours I spent on the internet trying to find lodging that would accept a cat. I understand now the beauty and danger of water. At 2:07 pm yesterday, I spoke to the owner’s son who said they were turning off water in the first four cottages. I was in cottage #8 and had yet to shower. Oops. I scrubbed myself with soap and water as though both might be scant for days. When I was through, I saw the owner walking outside surveying the rising water. I poked my head out the front door to ask, “When should I be concerned?” The water was significantly closer than just thirty minutes prior. “You should be fine,” he said but we agreed on a white parking stripe close to my cottage. If the water reached that white stripe, I was to drive the Jeep to the other side of the cottages which were three feet higher above sea level. “But you won’t see that until around midnight,” he said. Thirty minutes later, the owner stopped by, pointing at the white line with water covering it. “It’s there,” he said. I grabbed the fake evacuation backpack, my computer bag, and the grocery bag, tossing all of this into the back of the Jeep. Gatita was the last to go. The winds were rough now and the sound alone frightened her. She’d already hissed at me twice and I hadn’t lost my patience. I want an award for that sometime before I die. She was afraid, hell, so was I and I’m supposed to be the one in charge. I couldn’t know that this probably wasn’t anything serious. I’ve never factored in needing to evacuate anything, ever, in my life. I helped my husband to die – to die! I hiked the jungles of Chiapas where Jaguars sleep. I’ve slept outside in the Outback where dingoes can eat your face, and I’ve tried to order good coffee in Greece. But, I have never had to run from rising waters in a coastal town. The weather folks said they would call off coastal flood warnings at 4 pmEST then they extended that until 8 pmEST. Now it has been pushed to tomorrow, Tuesday, October 6th at 6 amEST. I can tell you what I was doing at 6 am this morning: Taking photos. The only reason I was up was because I hadn’t fallen asleep until 1:38 am, waking up at 3:47am, pulling myself up from the couch after 5 am when the storm broke at 25 mph winds. Yesterday, I didn’t know what that meant. Today I find it intoxicating, helping me to appreciate storm chasers and their addiction to the exhilaration of danger. Gatita and I will not flood where we are at this moment, back in our original cottage #8. I say this but I truly have no way of knowing as the toilet gurgles like it wants to regurgitate out whatever clear water is in there. I’ve had to halt my normal water conservation tactics of yellow/mellow, brown/down and instead flush the toilet every single time I use it for fear that it could back up. 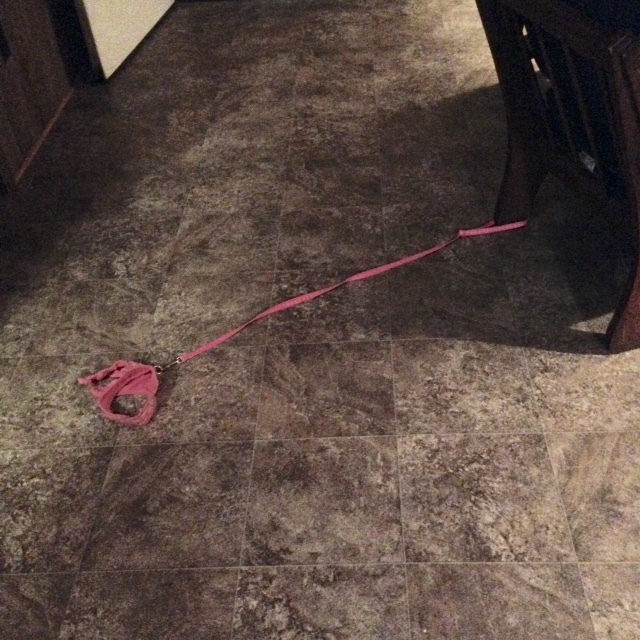 CLICK to enlarge: A master escape artist, Gatita figured out how to unbind herself from the pink harness and leash which was held down by a heavy chair. This was by far the scariest sight during the whole ordeal as I thought for a moment that she’d gotten outdoors during the storm. This crazy fool was going leave me here alone in the cottage for five days. Why did she bring me here at all? My only reprieve is to hide underneath the bed and no, I’m not sorry that I swipe at her forearms when she tries to reach me. She has this ridiculous pink (I hate pink!) body thing on me that she calls a “harness” which I secretly call a hard on because that’s how pissed I am. When she grabbed me, it was to take me outside. Was she insane? She could barely stand up. She covered my head and body with the master’s wool blanket that has pictures of fish and leaves and chipmunks. I tried to chase the chipmunk once. I’m not a horse, but that didn’t stop her from grabbing the back of my neck, preventing any type of escape. She had to struggle against me the moment she opened that cottage door because the wind slammed us sideways. And damn it, she didn’t leave the truck door wide open. Is she slow witted? I should have swiped her face then! Screw that. I followed her back to the door. Okay, so what, yes, I was afraid to be alone. You stay you wretched wench. You take me out of a comfy home, drag my hairy body across Confederate states. Yeah, you think I don’t see colors? And bring me to humidity followed by rain followed by water followed by wind. In what human universe is this fun? Then you try to tie me to a cottage chair and think that will hold me. Are you high, woman? And, you freak out, holding your hands to your chest, because you think I somehow learned how to unclasp the lock on the cottage door. If I knew how to do that, I would have left weeks ago! There is no amount of tuna that will make up for any of this. And screw your Cast Away moment when you found ice in the freezer. Get a life and stop trying to “treat me” to new adventures. I packed for one night and was able to return to our cottage to gather more things. When I returned for the second evacuation supplies, I brought Kurt Vonnegut’s, Breakfast of Champions. I didn’t read his book or the first one I brought either. Instead, I tortured myself with back-to-back Jurassic Park and Jurassic Park: The Lost World and wished Tea Leoni dead before her first scene ended. Safe and sound here in Kitty Hawk, not really, but what can I write except that which is happening in the moment. And yes, the storm is unbelievably mesmerizing. What would be in your evacuation pack? Hook’s backpack: Now my official evacuation starter kit.